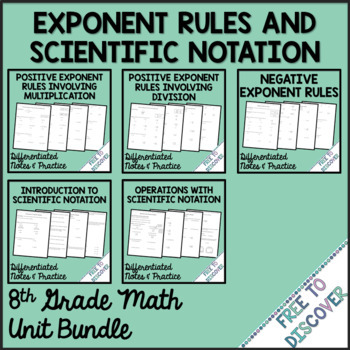 This resource includes differentiated notes and practice or homework for an eighth grade exponent rules and scientific notation unit. Includes the following properties of exponents: Product of Powers, Power of a Power, Power of a Product, Quotient of Powers, Power of a Quotient. Includes zero and negative exponents. Scientific notation topics include: converting between scientific notation and standard form, comparing numbers written in scientific notation, and operations in scientific notation. Each lesson includes 3 versions of notes and 3 versions of homework.